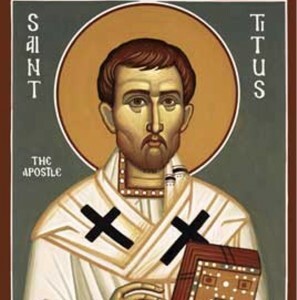 Today is the festival of St. Titus, Pastor and Confessor. Technically this is a memorial day on our liturgical calendar (like the Conversion of St. Paul). Memorial days are not intended to change your regular Sunday morning worship service (like say Christmas or Easter does). Instead, they are remembered in the Church’s prayer. Other propers are often assigned by different denominations, in case you wish to focus even more on the biblical themes the specific event or person presents to us today. St. Titus, like Timothy with whom he is often associated, was a friend and co-worker of St. Paul. Titus was a Gentile, perhaps a native of Antioch, who accompanied Paul and Barnabas to Jerusalem when they brought assistance to the Christians in Judea during a famine (Acts 11:29-30; Galatians 2:1). It is not known if he accompanied Paul on his first or second missionary journeys, but Titus was with him on the third one, when he helped reconcile the Corinthians to Paul (2 Corinthians 7:6-7) and assisted with the collection for the Church in Jerusalem (2 Corinthians 8:3-6). It was probably on the return to Jerusalem that Paul left Titus in Crete (Titus 1:4-5). Afterward he is found working in Dalmatia (2 Timothy 4:10). According to tradition, Titus returned to Crete, where he served as bishop until he died about 96 AD. Prayer: Almighty God, You called Titus to the work of pastor and teacher. Make all shepherds of Your flock diligent in preaching Your holy Word so that the whole world may know the immeasurable riches of our Savior, Jesus Christ, who lives and reigns with You and the Holy Spirit, one God, now and forever. Amen.